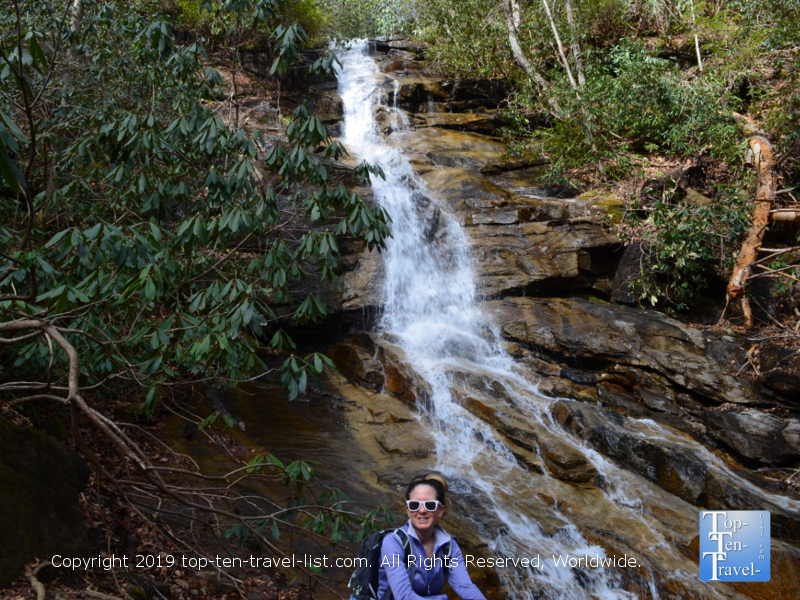 5 Easy Waterfall Hikes in Upstate South Carolina - Top Ten Travel Blog | Our experiences traveling throughout the US. 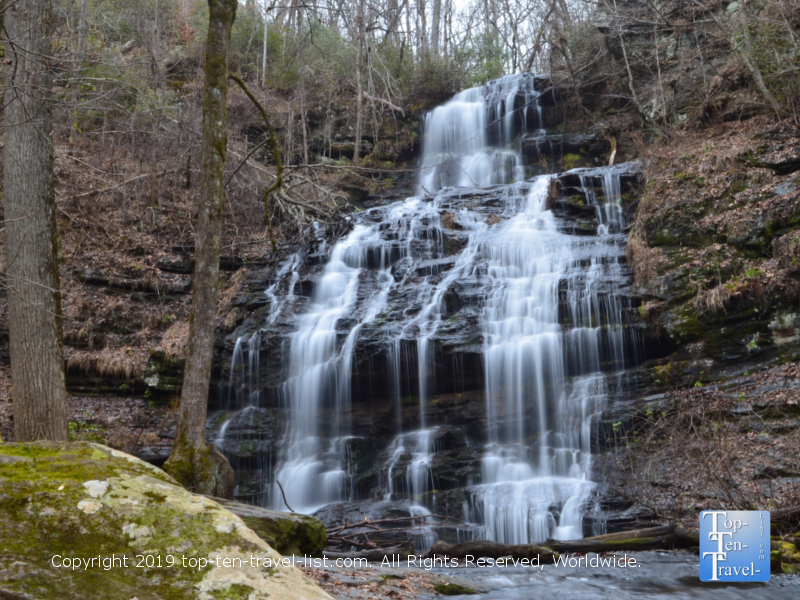 The Upstate South Carolina region is home to dozens of scenic waterfalls. Many of these are accessible roadside or via a simple hike. 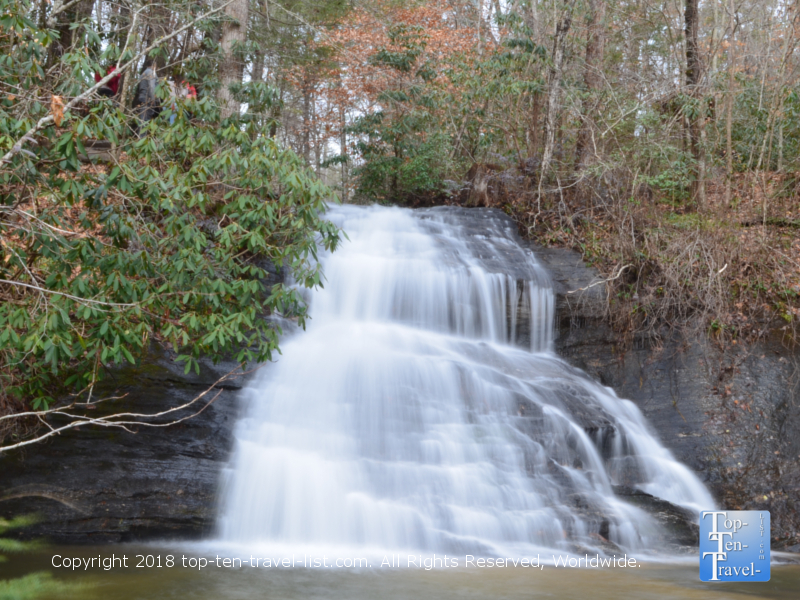 While visiting Greenville or surrounding cities, you will want to take the time to explore some of these gorgeous waterfalls, most of which are conveniently located within an hour or so from the city. Here are 5 of those most breathtaking easily accessible waterfalls to add to your Upstate SC bucket list. 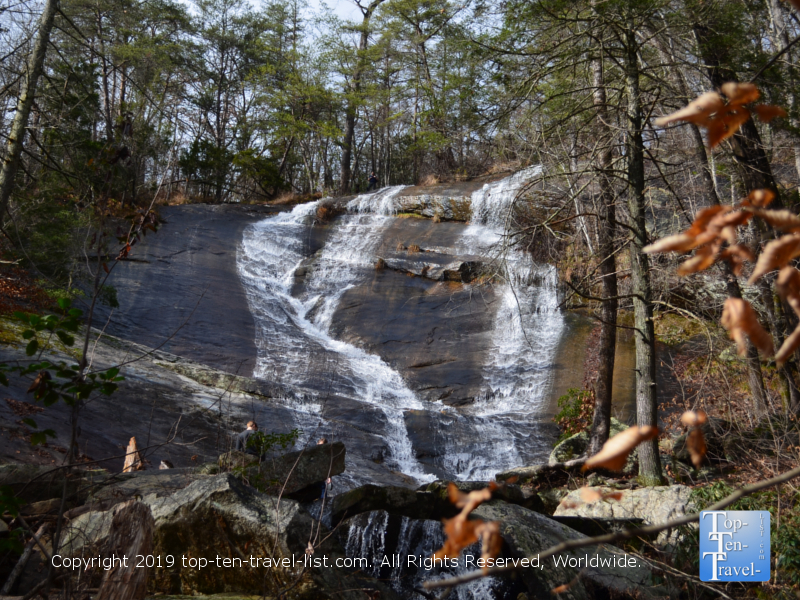 Wildcat Branch Falls is one of the most easily accessible waterfalls in the Upstate. This roadside wonder is located right off the road -just an easy 20 minute drive north of Greenville on SC 11, aka Cherokee Foothills Scenic Highway. 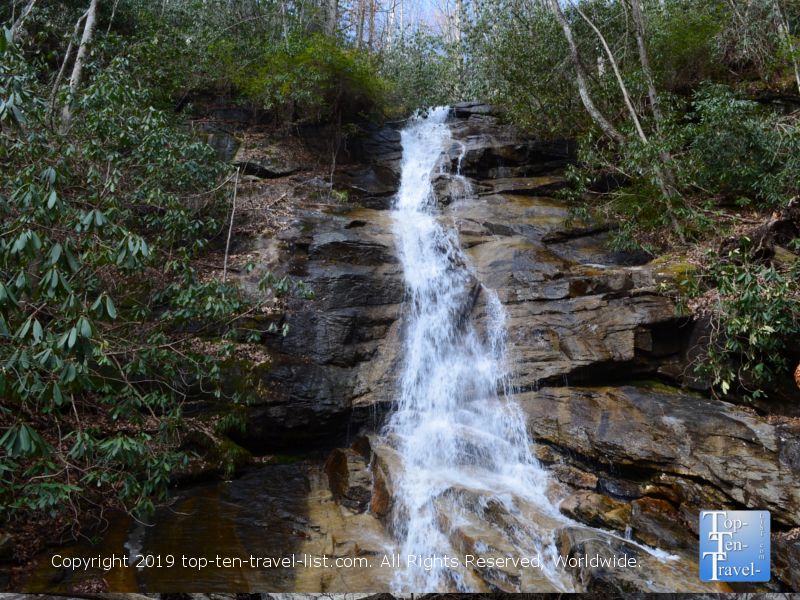 Surprisingly, this beautiful waterfall does not see much traffic despite its’ convenient location right off the highway, and thus, maintains a tranquil nature, especially during the cooler months. Although not very tall (about 20-30 ft), the volume and intensity of the waterfall makes it just as majestic as some of the larger ones in the area. Plus, it is so easy to get to, requires no hiking, and therefore, is accessible to pretty much anyone willing to drive. If you are up for a more intense adventure, you can enjoy a relatively easy 1 mile nature trek out to the beautiful 100 foot upper falls. A 1 mile mostly flat nature trail leads to you the Upper Falls. This nature trek is definitely worth doing if you have the extra time! Extra bonus: this waterfall is conveniently on the same route to numerous natural attractions including Caesars Head & Jones Gap State Park. Twin Falls is a set of beautiful cascading waterfalls which join together, with a mesmerizing height near 75 feet. This hike is very deserted, so much so that the forest takes on an eerie nature. If you love solitude, you will enjoy this short hike through the wilderness to this incredible waterfall. The hike to the observing deck is just 10 minutes or so (about a quarter of a mile). Because this trail is never overly crowded, it’s easy to take great pictures here, as opposed to the more popular waterfalls where you sometimes have to wait upwards of 15-20 minutes to take your photo. To make your drive more worthwhile, consider a sidetrip to nearby Table Rock State Park in Pickens, or Lake Jocassee, a popular daytrip destination for hiking, boating, picnicking, and exploring waterfalls. 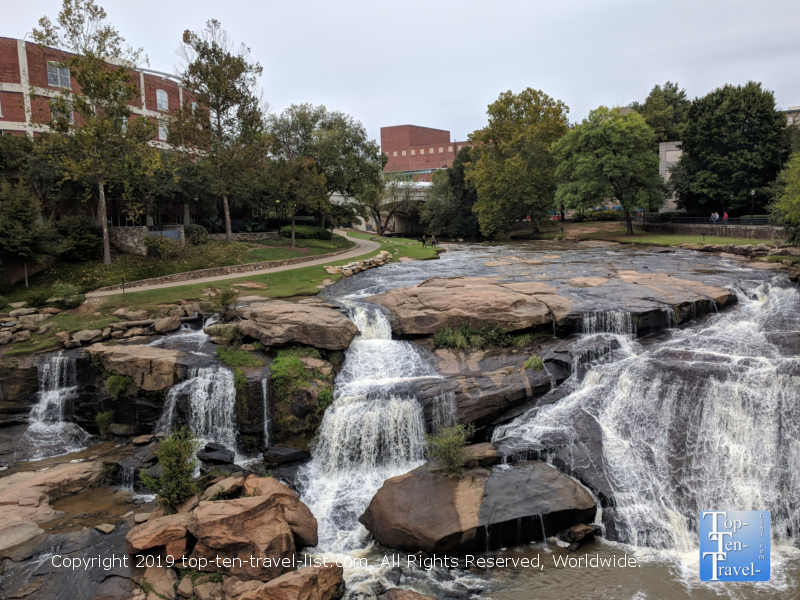 Reedy River Falls is the striking centerpiece of bustling downtown Greenville. The city draws immense tourism each year due to the pretty waterfall and adjacent Falls park. As the park is located right in the center of the ever growing downtown district, it’s considered the natural oasis of this busy city. A beautiful pedestrian suspension bridge leads you across the falls for a prime photo worthy view. Or, opt for a lovely stroll around Falls Park, which is home to peaceful nature trails, gardens, and relaxing hammocks & swing chairs. A French restaurant called Paserelle Bistro features a lovely patio overlooking the falls, and has been named one of the world’s most romantic restaurants. You will also find a great little local coffee shop called Spill the Beans, offering a full espresso bar, plus delicious gelato, & of course a great view. Issaquena is another beautiful waterfall accessible via a short 5 minute walk along a boardwalk. The super easy nature stroll to an observation deck leads you to an overlook of this 100 foot cascading beauty in the Sumter National Forest. 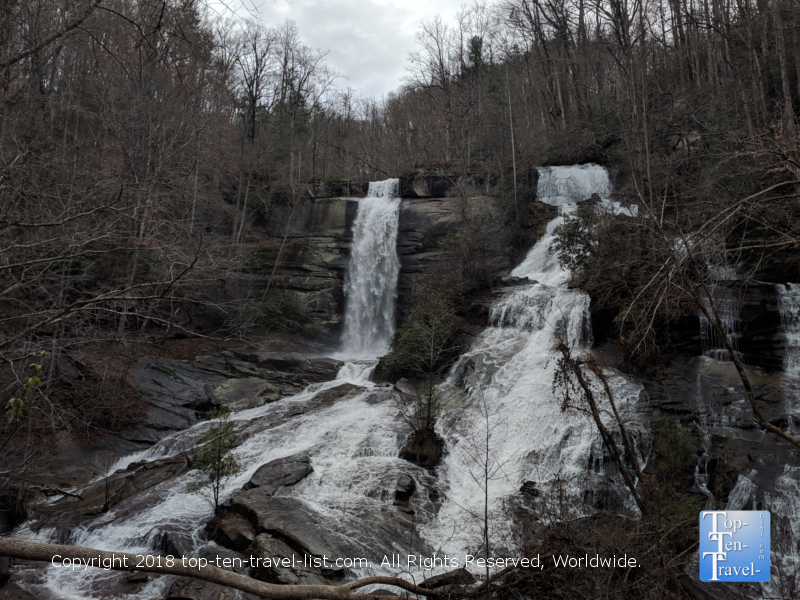 Although it’s a bit harder to get quality photos due to the angle, it’s still worthy of a visit, especially if you combine a visit here with other area waterfall hikes such as Yellow Branch Falls. The legend of the falls is quite interesting, so be sure to check out the info plaque before leaving. Another popular attraction right in the vicinity is the Stumphouse tunnel, a mysterious unfinished 1850’s rail tunnel which is now home to bats and other small creatures. Bring a flashlight if you plan on exploring as it can get pretty dark. Not surprisingly, there are tons of ghostly legends surrounding this creepy deserted tunnel. Station Cove is one of South Carolina’s most stunning waterfalls, and viewable via a short 1/2 mile long hike. After a refreshing 30 min hike through beautiful cove forest, you will arrive at the 60 foot tall stepped waterfall. The hike is very tranquil and never overly crowded, despite the immense beauty. If you really want some solitude, consider hiking this trail during the fall or winter months. Thea area rarely sees snow, although the temperatures are still very crisp. The air is cold & refreshing with an absence of muggy humidity. Simply dress appropriately and enjoy the quiet winter bareness of the forest. Although the trees will be leafless, the trek is so peaceful and parking easily found. If you are looking to maximize your daytrip, combine this hike with nearby Issaquena, Stumphouse Tunnel, Oconee State Park or Chau Ram park. Jones Gap State Park joins Caesars Head State Park in a beautiful 13,000 acre woodlands area known as the Mountain Bridge Wilderness. 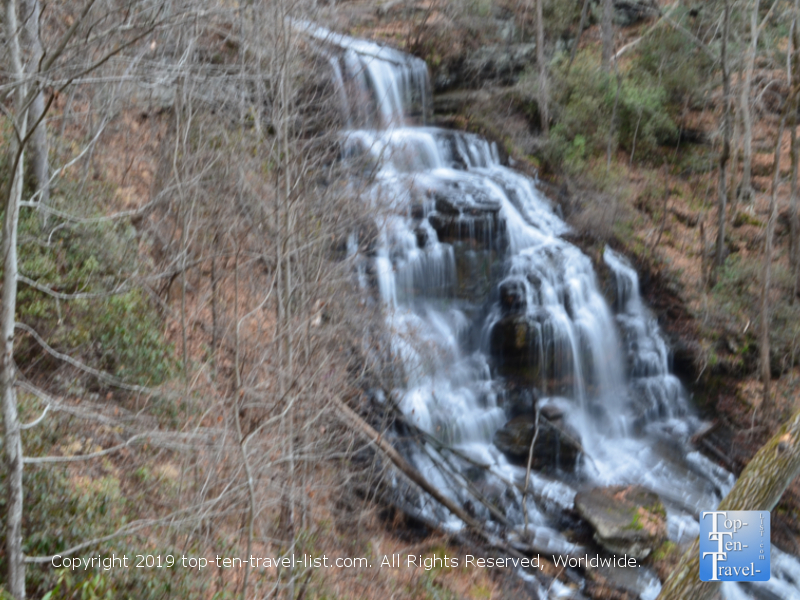 The Jones Gap hike will take you to several waterfalls, the first being Jones Gap falls. The hike out to Jones Gap falls is an easy 1 mile out-and-back adventure that is simple enough for most families and beginning hikers. The 50 foot waterfall is isolated and scenic and the plant life surrounding the falls very lush, making this one a bit better suited for the spring or summer season. From here, you can continue on a slightly strenuous 1+ mile, steep journey to the 125 foot tall Rainbow Falls. If you plan on embarking on this extra adventure, bring with plenty of water, a few snacks, and be prepared for a moderately intense workout. As one downside, this park is very popular and parking is limited. Arrive early in the morning, preferably during the off season or during the week to avoid a lengthy wait. *Trails are often extremely muddy, especially after intense rainstorms. 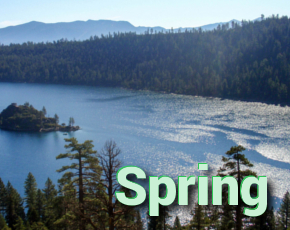 Wear proper hiking shoes and workout apparel. Bring a second pair of shoes to switch into after your hike. A hiking stick also comes in handy. *Eat breakfast before arriving at the trailhead. There are plenty of options in Greenville. 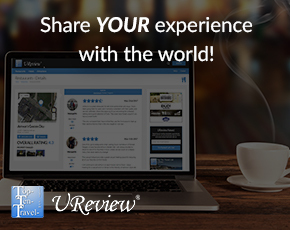 Check out my favorite restaurants for breakfast in Greenville. *Some of these parks are heavily visited in the spring and summer months, especially Jones Gap. Consider visiting on a weekday or the off-season to ensure no wait for a parking spot. *There is no water available at any of the trailheads. Bring with at least a liter. For longer hikes, I recommend a camelbak to ensure you are properly hydrated. *Bring with a snack for longer hikes and something to refuel after your hikes. Most of these hikes are pretty isolated with no restaurants in the vicinity. A few good post-hike lunch choices in Greenville include Handi Indian (great lunch buffet! ), Frankie’s pizza (authentic NY style pizza in a casual space), Rick’s Deli (casual deli fare in a comfortable setting in downtown Greenville), and Roost (a great local restaurant inside the downtown Greenville Hyatt featuring an excellent weekday lunch buffet).